We never expected to co-sleep when O arrived. I was adamant that she would sleep in her own cot (and when she was older) her own bed. I always felt that it would help with her independence for when she grew up. (I have no scientific proof of that but I felt she may be more “needy” if she slept with us every night) I don’t know why I was dead against bed sharing, but I was. I’ve written in previous blog posts about O being a good sleeper at the beginning and I never expected that to change so dramatically and going from sleeping all night to waking up and wanting us beside her was a major change in our lives. Looking back, I thought I was doing something wrong when Olivia started to wake up at night and wouldn’t settle until we were with her. But it was just one of those things, her needs changed and we just had to go along with her. I won’t lie, it was frustrating and it caused several arguments with my fiancé and I but as we all know when you’re woken in the middle of the night and your child will only go back to sleep when you are lying beside them, then that’s what you’ve got to do. We’ve tried numerous ways to soothe her back to sleep, I even consulted a sleep expert but nothing worked long-term. The hardest nights were when we had work the next day. It’s mentally and physically draining to keep getting in and out of bed to tend to her every time she woke up, so sleeping together is where we’re at right now and do you know what? It’s ok.
It’s only now, I’m accepting the fact that we’re co-sleeping/bed sharing. I’m not looking into it too deeply. It’s got a label but I know many people that have done it in the past, way before it’s official name came on the scene. Olivia likes sensing us beside her, I’m not sure whether it’s for security or warmth but whatever it is – if it’s good for her it’s good for us! As a matter of fact, I quite like it now too. The more we continue to sleep in the same bed, it feels odd when she’s not beside me. For so long I’ve tried to parent in a way that I thought was “by the book” but as the years go by, I’m saying, ‘feck the book’, now we’re doing what suits us. There comes a time that all of that stuff goes out the window. Now, when things don’t work out in a way I thought was right, I don’t see it as a parenting fail anymore, if it works for us then that’s all that matters. And I’m yet to meet someone who doesn’t want a good nights sleep at the end of the day, because that’s the bottom line really! Ok, prepare yourselves for the cringe fest…. One night back in January I had that eureka moment that we were “officially” co-sleeping and I wrote this little rhyme while Olivia was sleeping soundly beside me. I don’t know why it came into my head, but it did and it just gave clarity to everything. 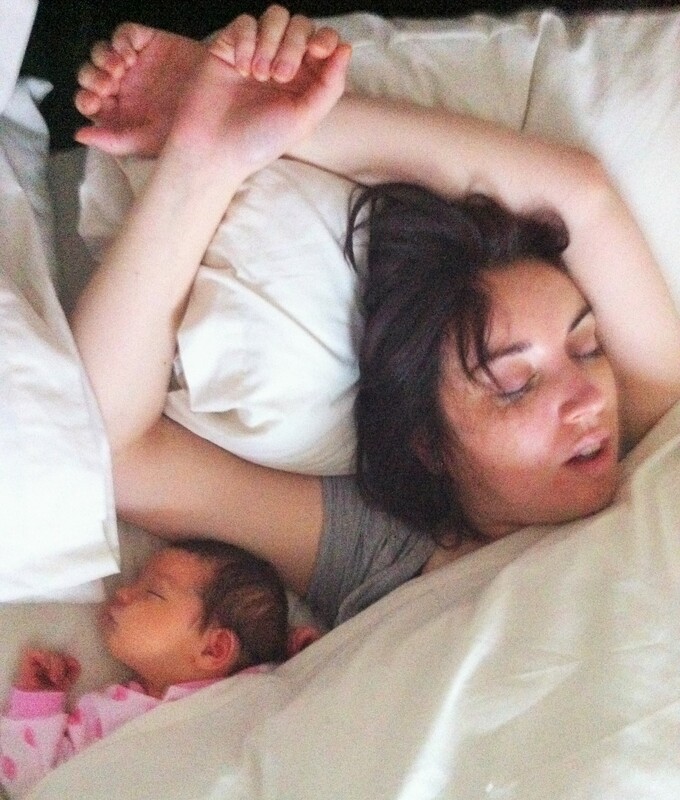 A photo I found from the early day’s – Co-Sleeping during the day. This may have triggered something when she got older, who knows! I’m not a big fan of Co sleeping but we do Co sleep half way. What I mean by that is that my nearly 4 year old wakes up in the middle of the night and just walks into our room and goes back to sleep. I honestly don’t mind because he goes straight to sleep. Trying to explain to him in the middle of the night that he has to sleep in his own bed and then the fear he wakes chloe I just put up with him sleeping beside me.